With Thanksgiving rapidly approaching and me in charge of pies I thought I had better get busy thinking about what I will make. I have been on a roasting kick lately, autumn has that affect on me. I have put just about every vegetable and fruit in my oven. No, I am not the witch in Hansel and Gretel. I just love what roasting does. Instead of draining the flavor from fruits and vegetables it intensifies them. When it comes to pie I like a crisp, buttery, crust with lots of filling. 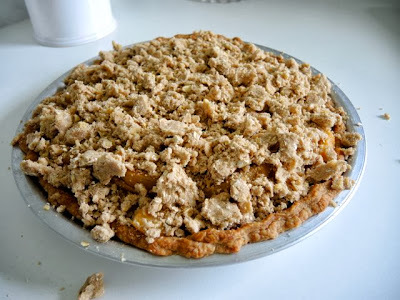 The trouble with a fruit pie is all that fruit can take a long time to cook releasing a lot of juice which makes the crust soggy. 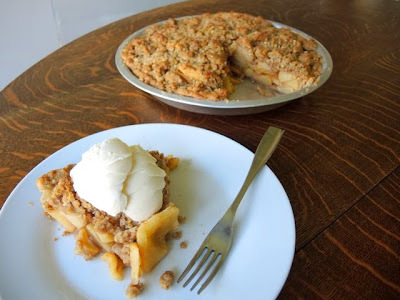 I decided to roast the apples first, blind bake the crust and then finish the pie in the oven with a healthy sprinkling of nut infused streusel. 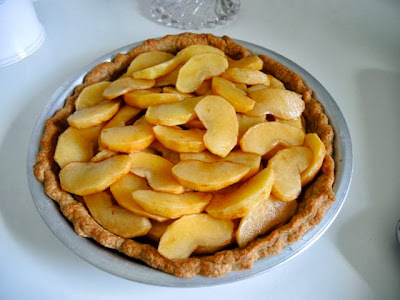 Recently, a friend gave me an article about making the perfect pie crust. 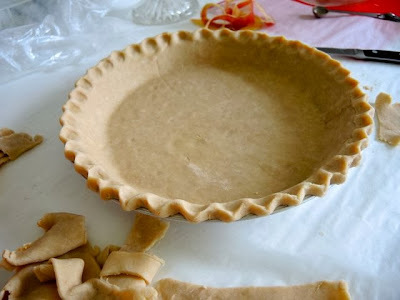 It recommended replacing part of the water with alcohol such as vodka or rum for a flaky crust. I incorporated the idea into this pie. The alcohol bakes out. If you use vodka you won’t taste it. If you want a little flavor you can use dark rum. If you prefer an all-butter crust with no alcohol use the pie dough recipe from my blog post on cherry pie. There are a few steps to make this pie, but it isn’t hard. I think the results are worth it. Start by making the pie dough. While it is chilling, roast the apples. While the apples cool, blind-bake the pie shell. Make the streusel topping while the pie shell cools. Then assemble for the final minutes in the oven. My parents cheerfully agreed to taste-test the pie. Perhaps they are a bit biased, but we all agreed the results yielded a very flavorful apple pie. 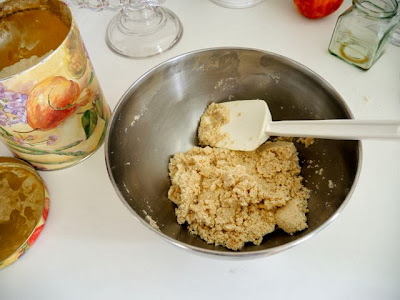 By starting the dough in a food processor and finishing it with a rubber spatula in a bowl you get the most even mixing without over-doing it. Process the dry ingredients and the butter in the food processor then transfer to a bowl before adding the liquid and bringing the dough together with a rubber spatula. 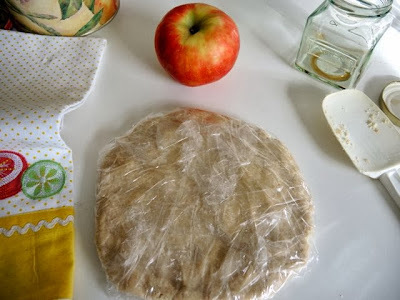 Form the dough into a disk and wrap tightly in plastic wrap. Allow dough to rest in the refrigerator for an hour. Tuck the over-hang of dough under the rim before crimping the edge for a more uniform edge. Put the flour, sugar, and salt in a food processor with a medal blade. Pulse a few seconds to blend. Add chunks of butter and pulse until mixture looks like coarse meal, 10-20 seconds. Pour mixture into a bowl. Mix water and vodka together, sprinkle over the flour mixture. Stir with a rubber spatula just until dough comes together. Do not over-mix. Form dough into a disk and wrap in plastic wrap. Refrigerate for an hour. Remove dough from the refrigerator and let sit for a few minutes to soften. Roll out dough on a floured surface or between parchment paper and fit into a 9-inch (23 cm) pie plate. Trim overhanging pieces tucking them under the dough around the rim. Crimp around the rim of the pie plate using your fingers to make a decorative edge. Loosely cover the dough with plastic wrap and refrigerate for 30 minutes. Line chilled pie dough with foil or parchment paper and fill with pie weights. Bake dough at 375℉ (190℃) for 20 minutes. Remove foil or parchment and pie weights, continue baking another 5-10 minutes until golden brown. Cool on a wire rack. Preheat oven to 350℉ (175℃) degrees. 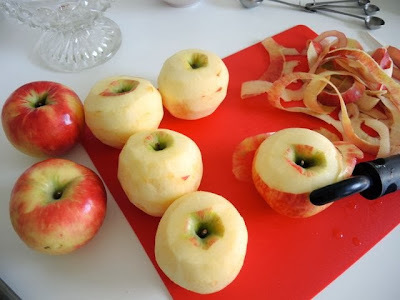 Wash, dry, peel, core, and quarter apples. Cut each quarter into four slices. 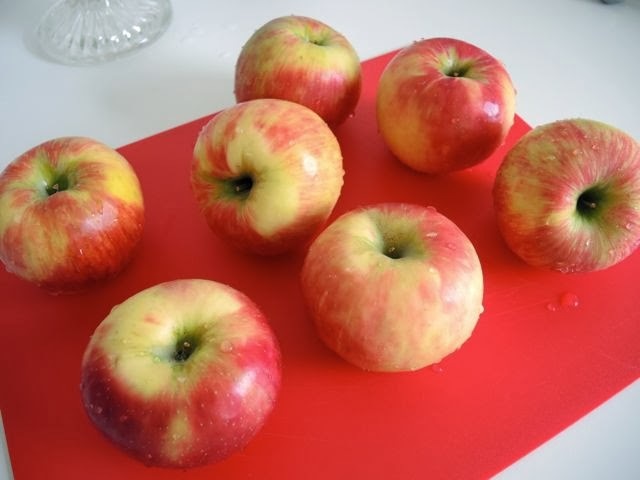 Toss apples with sugar and cinnamon in a large bowl. Scatter in a single layer on two rimmed baking sheets. 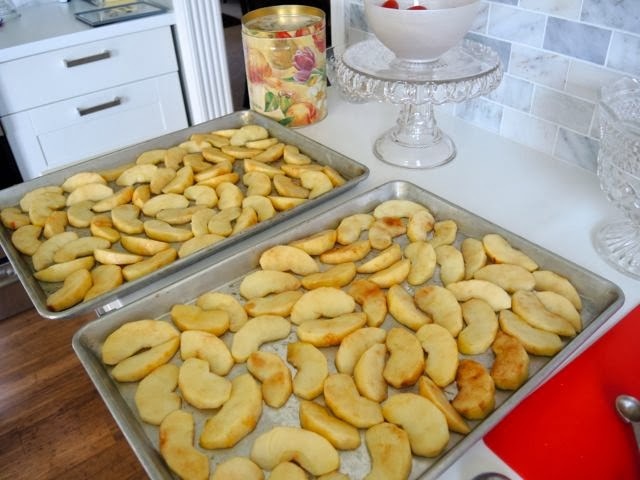 Roast in the oven for 20-25 minutes until the apples are tender and the juices begin to caramelize. Rotate the baking sheets after 10 minutes to ensure even cooking. Allow the apples to cool before filling the pie crust. 4 tablespoons (2 ounces/60 g) unsalted butter, chilled, cut into pieces. Pulse flour, oats, nuts, brown sugar, and cinnamon in a food processor to combine. Add chilled butter pieces and process until mixture starts to clump. Transfer to a bowl and squeeze between your fingers to make rough chunks. To assemble the pie put the cooled, roasted apples in the cooled pie crust. Add any juices from the pan to the apples. Sprinkle the streusel topping over the apples. Bake in a 350℉ (175℃) oven for 25-30 minutes until the topping is browned. I think apple pie is best served warm à la mode.